Twenty-five years ago today — November 8, 1984 — Space Shuttle Discovery launched from the Kennedy Space Center on mission STS-51A. Astronauts Frederick H. (Rick) Hauck, David M. Walker, Joseph P. Allen, Anna L. Fisher, and Dale A. Gardner deployed two satellites, Telesat-H (Anik) and Syncom-IV-I (also known as LEASAT-1), and retrieved two disabled communications satellites, Palapa-B2 and Westar-VI. It was the first time two satellites were captured for return to earth, and demonstrated a capability that only the space shuttle had (and still has, for as long as we continue to operate shuttles*). Their week-long mission ended on the 16th when Discovery landed back at KSC. *Makes me wonder if a space-retrieval capability could be a money-maker for some savvy space entrepreneurs…. Our first space history item is interesting, but not the main event: On October 1, 1949 — 60 years ago today — the Long Range Proving Ground was activated at Cape Canaveral, Florida. It became the Florida Missile Test Range, and eventually Patrick Air Force Base and the Kennedy Space Center. But the event that elicited this post’s subject line happened 40 years ago today, in 1969, when the European satellite “ESRO-1B” was launched from Vandenberg AFB by a Scout rocket. The NASA press release for the launch is very interesting: it includes pages of background information that must have fed the interest and imagination of every would-be “steely-eyed missile man” in the general public. A 176-pound satellite carrying eight experiments to study the polar ionosphere, the Northern Lights and related phenomena, is scheduled to be launched by a four-stage Scout rocket from the Western Test Range, Calif., no earlier than Oct. 1, 1969. Called ESRO-1B, the European designed and built satellite is the fourth in a cooperative program between the European Space Research Organization (ESRO) and the National Aeronautics and Space Administration (NASA). The program is carried out under terms of an agreement signed by the two organizations in December 1966, relating to providing ESRO with launching and associated services. 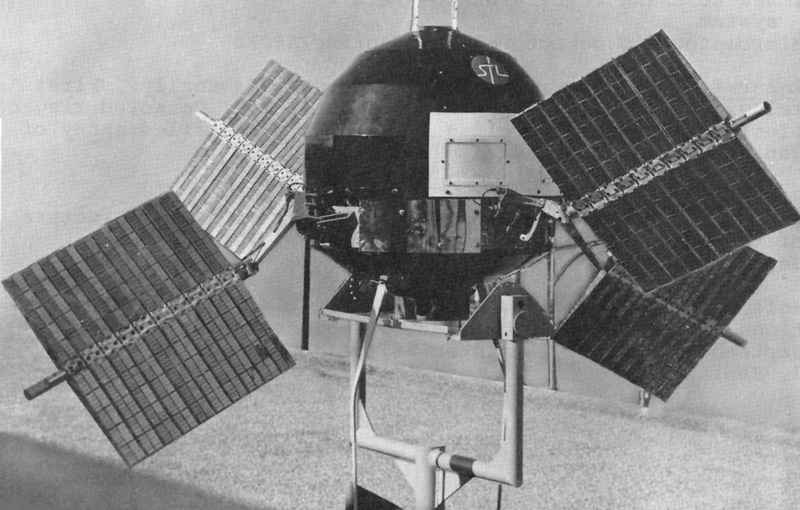 ESRO-1B is a duplicate or backup version of ESRO 1-Aurorae, a cooperative ESRO/NASA project, which was successfully launched into a highly elliptical near polar orbit by NASA on October 3, 1968, and is still operating. The same complement of eight experiments–a series of high-latitude particle detectors, auroral photometers, and Langrnuir probes–is being carried on board ESRO-1B. The experiments were provided by the Technical University of Denmark; Kiruna Geophysical Observatory, Sweden; the Radio and Space Research Station, Slough, England; the University of Oslo, Norway; the University of Bergen, Norway; the Norwegian Defense Research Establishment; and the University College, London, England. The orbit planned for ESRO-1B is near-polar, inclined 86 degrees to the Equator, with an apogee of 435 kilometers (about 270 statute miles) and a perigee of 400 kilometers (about 248 statute miles). Orbit period will be 92 minutes. Scientific measurements made by the ESRO-1B will be concentrated over Northern Europe to enable correlation between ground-based polar ionosphere observations and measurements made simultaneously with sounding rockets launched from the ESRO launch site at Kiruna, Sweden. Once injected into orbit, the ESRO-1B will be despun by means of a yo-yo system to about 1 RPM. Final stabilization will occur about 10 days after launch when the spacecraft locks onto the Earth’s magnetic field. This stabilization is achieved by means of a pair of magnets inside the satellite. To minimize oscillations, slender magnetic rods are also mounted inside the satellite. Launch Window: 30-minute window which changes only slightly from day to day. The window opens at 3:29 p.m., (PDT), October 1, 1969. Launch Site: Western Test Range, Lompoc, California, Pad SLC-5. Launch Vehicle: Four-stage solid fuel Scout rocket. Stabilization: Spacecraft is spin stabilized at about 148 rpm initially. Despun to one rpm by yo-yo mechanism and further despun by magnetic system which interacts with Earth’s magnetic field. Stabilization thereafter will be provided by a passive system consisting of two permanent magnets. I find the inclusion of all the detail fascinating. But maybe that’s understandable, since I still am a would-be rocket scientist. Forty-five years ago today — August 28, 1964 — the Nimbus-1 satellite, “the first in a series of second-generation meteorological research-and-development satellites,” launched from Vandenberg AFB on a Thor-Agena rocket. a short second-stage burn resulted in an unplanned eccentric orbit. Otherwise, the spacecraft and its experiments operated successfully until September 22, 1964. The solar paddles became locked in position, resulting in inadequate electrical power to continue operations. Nevertheless, Nimbus-1 produced the first nighttime cloud-cover images from space and was followed by six more satellites in the Nimbus series. Science fact meets science fiction … I like it.